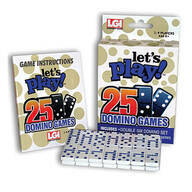 With jumbo numbers instead of dots, these number dominoes are easy to see, count and tally scores! Double 12 set includes 91 numbered dominoes, hub centerpiece and eight train markers for Mexican train. 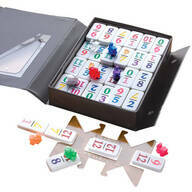 Dominoes with numbers feature snap-close vinyl case and game guide with rules. Ages 6 and up.